The Ogdensburg Amateur Radio Club has been involved with many events in the community. Shown below are a some of the certificates from these events. K2RUK helped the City of Ogdensburg celebrate their 250th anniversary in 1999 with this certificate for contacts made. 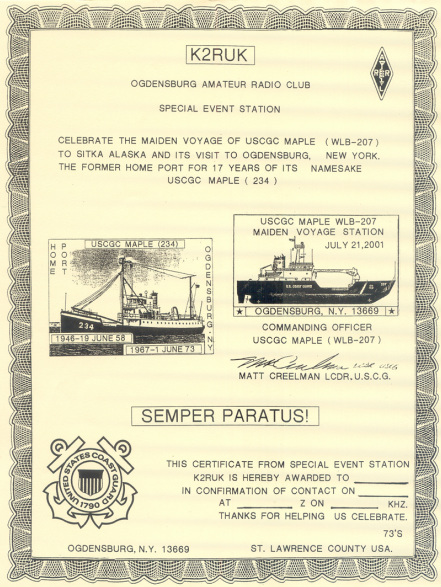 Also the Ogdensburg Amateur Radio Club has helped celebrate the maiden voyage of the USCGC Maple, named for another ship that had been stationed at the Ogdensburg US Coast Guard Station. And in 2013 the Ogdensburg Amateur Radio Club helped the Frederic Remington Art Museum celebrate its 90th anniversary.